Love this! Excellent quality and would highly recommend! It's perfect for the space in my bedroom! I am happy with this purchase! 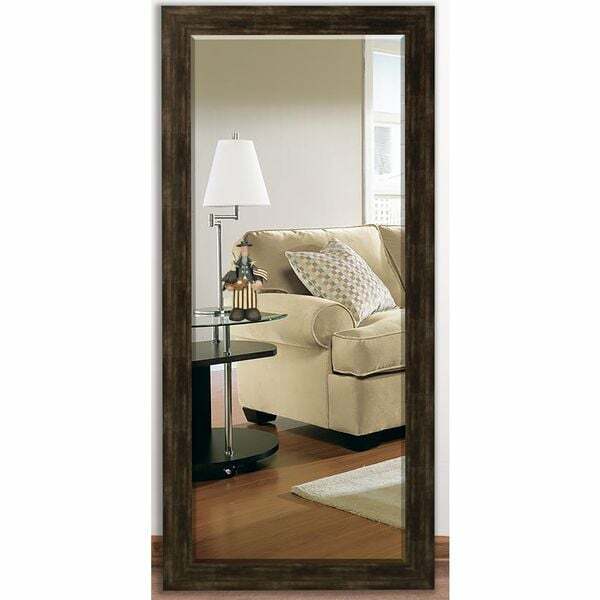 Make a statement in your home with this amazing full-length wall or floor mirror. The frame has a stunning brushed finish that beautifully showcases metallic hues, as well as grays, browns, and reds. Its clean lines along with the beveled mirror give it a modern feel, while the colors give it an aged quality This piece is certain to add style to any space. The quality of this mirror is lacking. I expected a much finer wood, it feels very light which is nice for hanging however also gives it a sense of cheapening in quality. The paint job well it’s not a stain it’s a strange metallic again not quality color very plastic looking. I’m also not a fan of the beveled edges they don’t really make sense to me. US Made! Arrived Fast and In Perfect Shape! US made with Good Value and they said it cant be done! Insource and employ an American today! Excellent quality!!! Great price (I bought on sale). Comes with hangers (cleats) attached to accommodate hanging either vertical or horizontal, and the cleats make it a breeze to hang. Mine hangs horizontal over a 75" buffet. Only needed help hanging due to the size and weight, (I went with the 30.5x71). It does seem to have a little more gold hue than I anticipated but still works fine for me. This may be in part my monitor or the room lighting. Regardless, I still feel it is a 5-star piece!! I love this mirror! We put it horizontally in our livingroom and it matches the decor perfectly. Very durable. High recommend this purchase!!!! Awesome quality, put one on my balcony, I love in a high rise, strong wind knocked it over and it didn’t crack! Now that’s quality. I LOVE my new mirror. The size is perfect and looks great in my bedroom!